WILD OATS XI… ROLEX SYDNEY HOBART YACHT RACE 2012 WILD OATS XI: Sixth victory in the Sydney Hobart yacht race and new record! 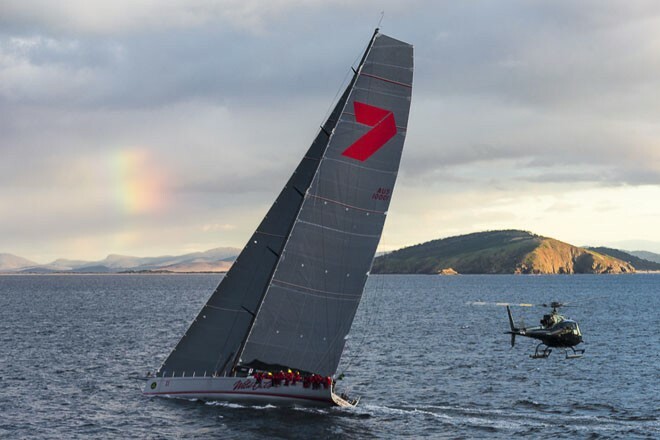 Re-launched three weeks prior the Sydney-Hobart yacht race 2012, Wild Oats XI has again become the undisputed winner! It is interesting to see what kind of change its designers Reichel/Pugh have made particularly on its appendages. In 2011 Investec Loyal (ex-Maximus & then now Ragamuffin Loyal) – a 2005 Greg Elliott’s design – defeated it by 2 minutes and 48 seconds but Wild Oats XI wins again this year, on elapsed and corrected time! 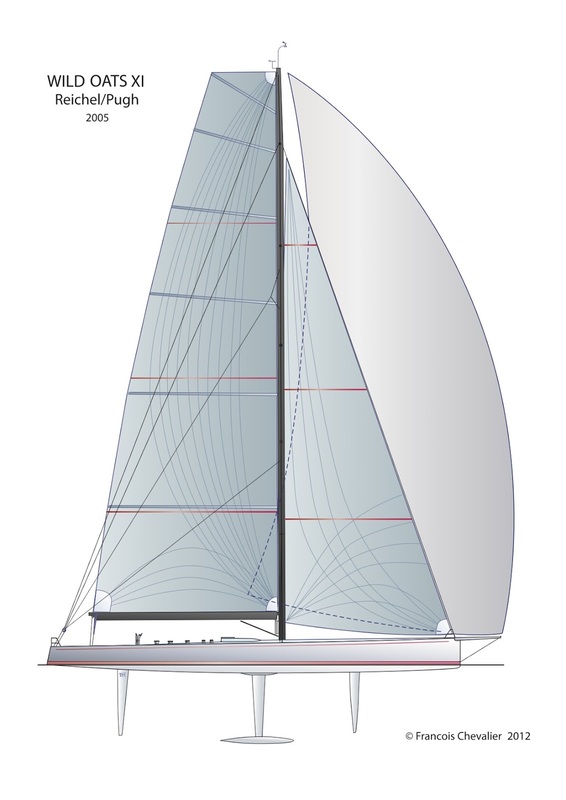 Note that the second, Ragamuffin Loyal ex-Investec Loyal, dates from 2005 and the third one Lahan (ex-Konica Minolta & Zana) is a 99-foot designed in 2003 by the New-Zealander Brett Bakewell-White – recently optimized for the IRC, a light displacement, fixed keel and reduced draft (4,33 m). 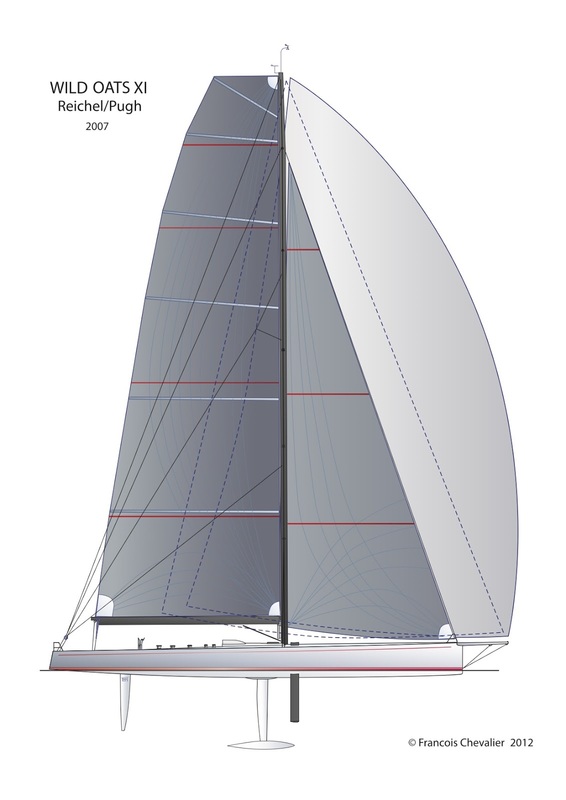 Note that this year the second, Ragamuffin Loyal ex-Investec Loyal, dates from 2005 and the third one Lahan (ex-Konica Minolta & Zana) is a 99-foot designed in 2003 by the New-Zealander Brett Bakewell-White – recently optimized for the IRC, a light displacement with a fixed keel and reduced draft (4,33 m). 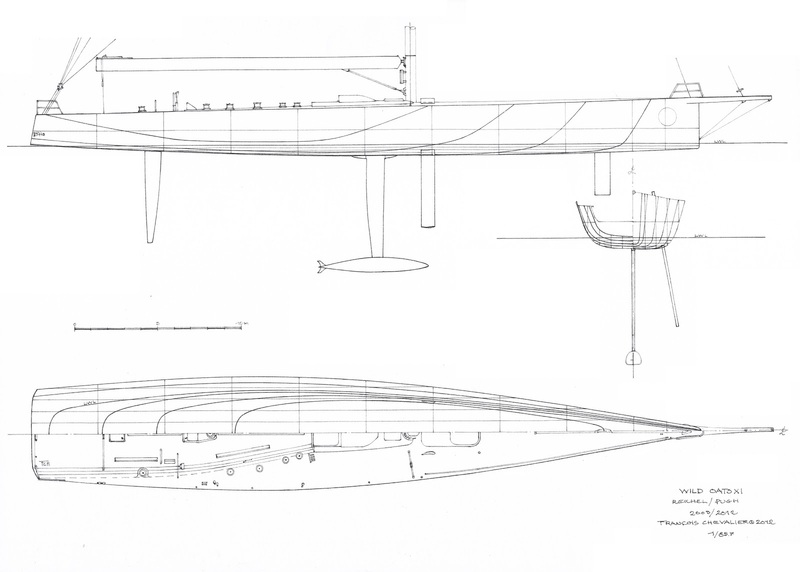 Redrawn from many photos, the lines plan shows a hull with slightly rounded bilges, with flaring sides, a narrow waterline (4,10 m) and a depth hull positioned forward the keel. When heeling the waterline uses all the boat length; the wetted surface is reduced but the flaring sides do not have the anti-drift fins role as it happens with more recent hull shapes with hard-chine as Farr’s ICAP Leopard or Juan K’s Rambler 100. 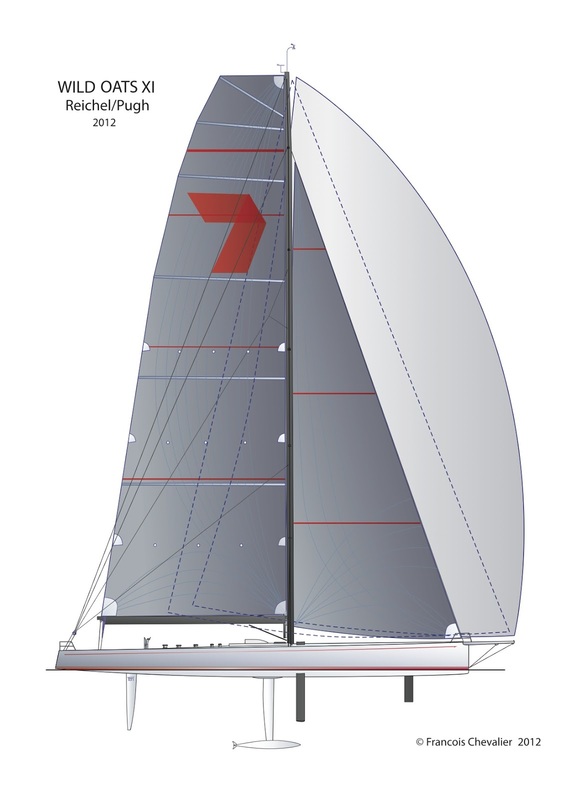 Added in 2012 the forward daggerboard with its thick profile aims to correct the instability when luffing-up or bearing-off on the crest of the waves when downwind sailing. 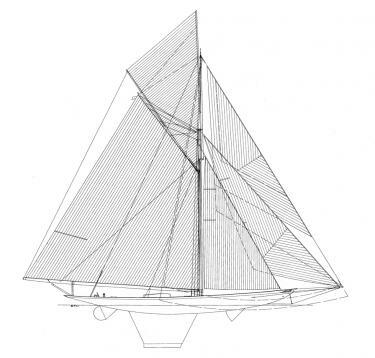 Indeed, with these long light displacements stretched with imposing bowsprits, the downwind sails shift the center of the sail plan far forward. This tends the boat to be slack. 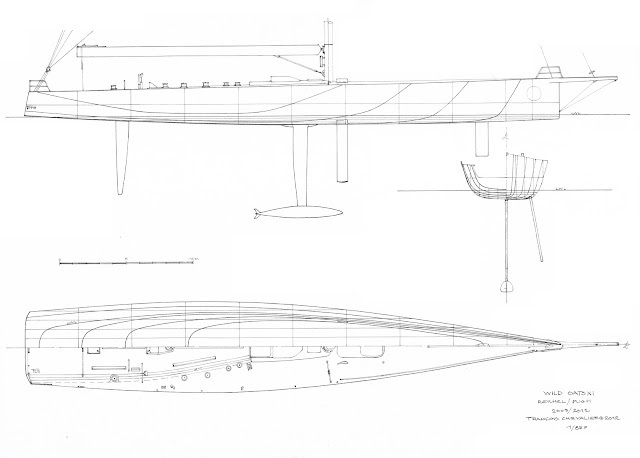 The improvements to the structure and all the boat have allowed saving weight that has been put in the keel. The vertical winglets behind the bulb replace the classic winglets in an innovative way. The small flat part on the back generates two eddies that are scattered by theses winglets. More! 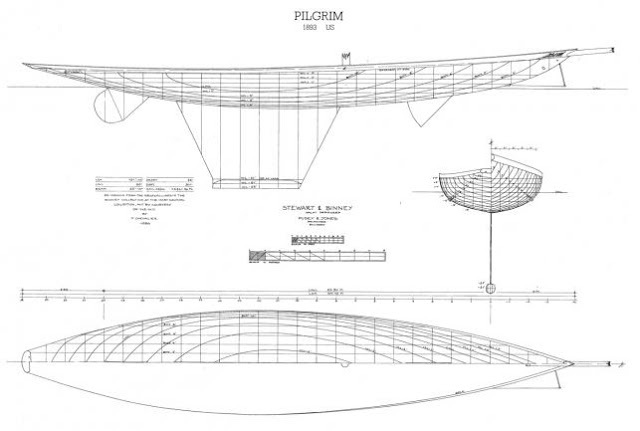 These two wings generate a stabilizing anti-drift fins when the keel is canted to windward. 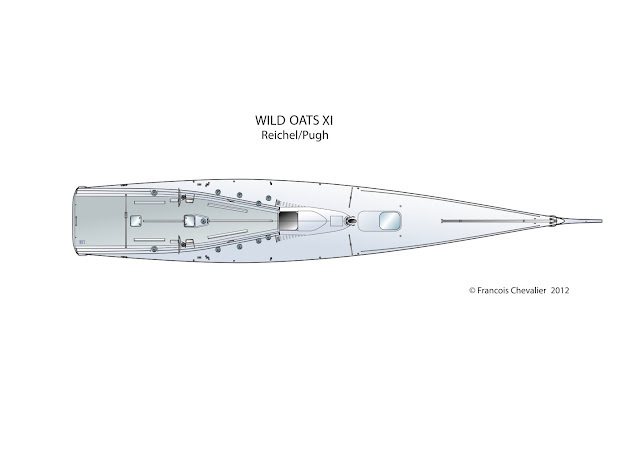 Between 2007 and 2008, Wild Oats XI was fitted with its two daggerboards forward the mast, sloped by some ten degrees, that corrects the tendency to slide on its upper-works when heeling. 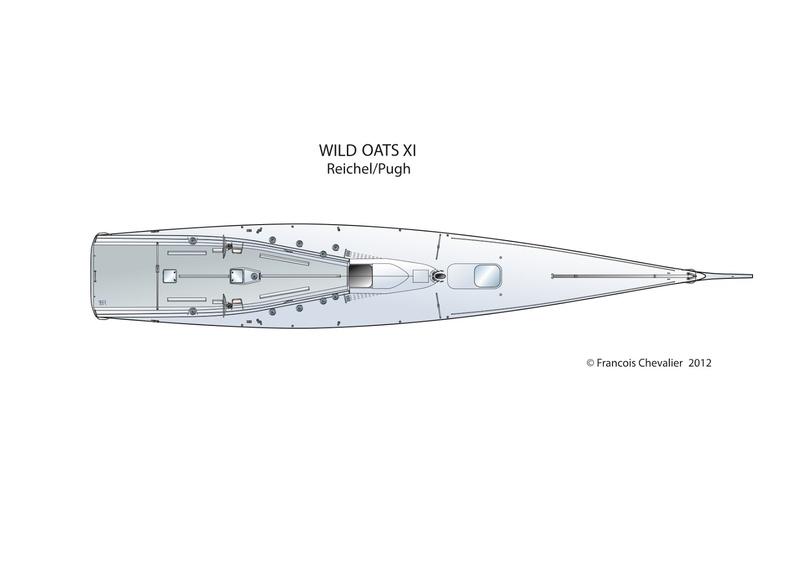 In 2005 Wild Oats XI was a development of Wild Oats IX, a 60-foot launched in 2002 and record holder of the 2003 Sydney-Hobart race, fitted with the same appendages – canting keel and two rudders one as a canard. 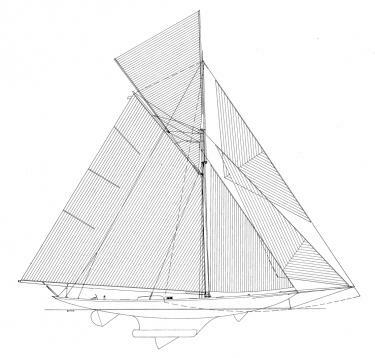 Pilgrim had been designed by Steward & Binney – successors of Edward Burgess three times winner of the America’s Cup in 1885, 1886, 1887 – was a pure steel bulb keel boat fitted with a forward daggerboard. 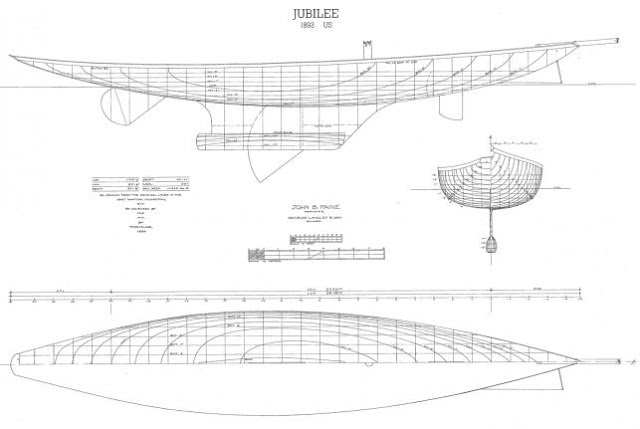 Jubilee, drawn by John Paine, was a bulb keel yacht fitted with a complementary daggerboard under the ballast of the keel, an innovation taken up on the first Wally, Wallygator, and a forward daggerboard. 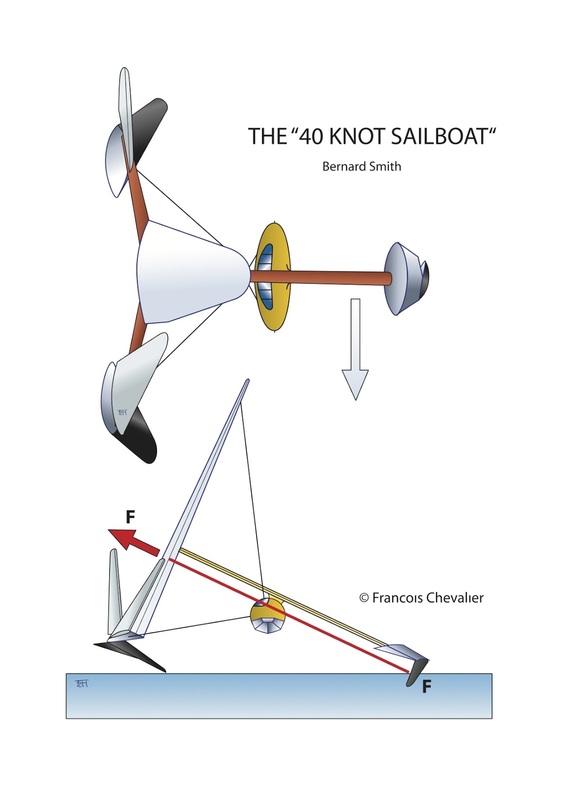 ... and the "40-KNOT SAILBOAT"
What really impressed yacht designers and researchers during the last fifty years was Bernard Smith's “40-Knot Sailboat”. Published in 1963 his three points hydrofoil has since arise many projects as Macquarie Innovation and Paul Larsen’s Sailrocket. The wing of the last one is inclined and its center of thrust corresponds to the thrust of the foil. 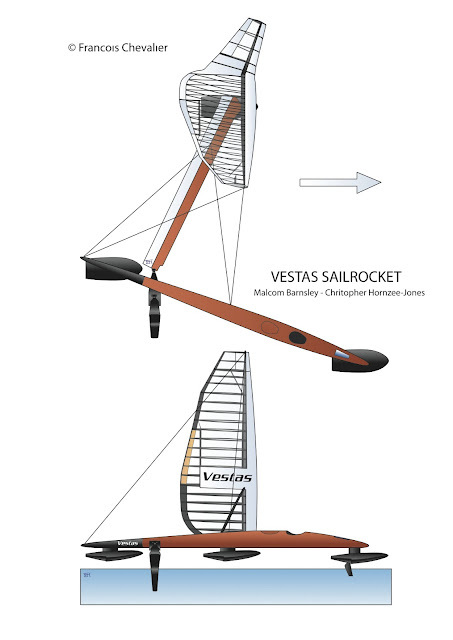 The originality of Sailrocket and its superiority over the previous projects is to move the axis of the boat in relation to its efforts – allowing access to the course of the foil without disturbance – all the weights being place as close as possible forward – this counterbalancing capsizing effort by focusing them to the increase in speed. At high speeds the cigar-shaped hull is moving into the apparent wind’s axis (22 degrees from the displacement axis). The foil has a special super-cavitation profile very different from the usual forms. The easy experiment of a knife in the water shows how reacts an immersed blade propelled at constant velocity. Pushing or pulling the knife generates a significant force. 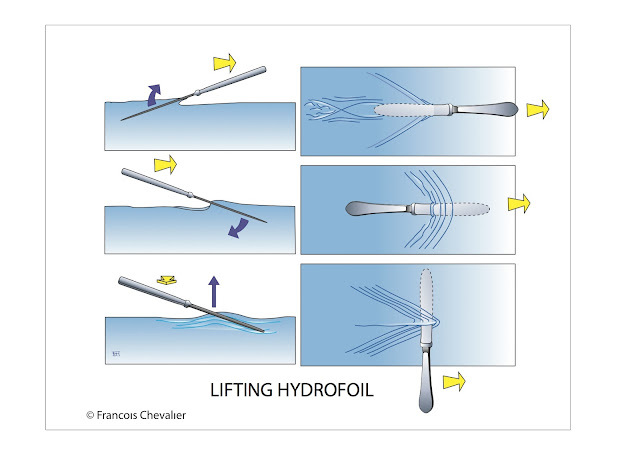 When inclined the knife going through the water with a slight angle tends to lift. 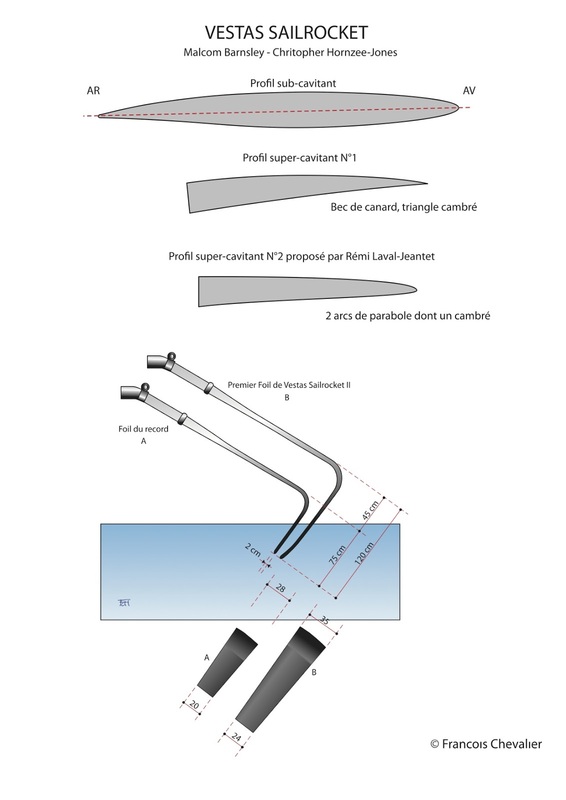 Calculations applied on the foils greatly encouraged to reduce the length of the foil going from 1.20 to 0.75 meter then 0.60 meter – referring to the latest version – the immerged surface reducing the speed. The profiles listed above are sub-cavitating type and super-cavitating type. 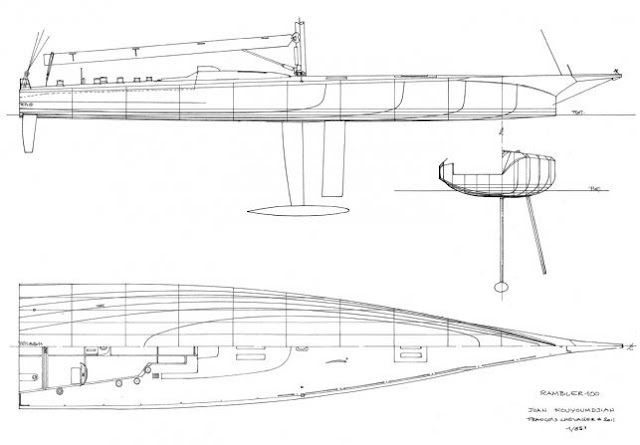 Beyond speeds higher than 50 knots, the number 1 version (camber duck-billed type) did not exceed 50-52 knots. 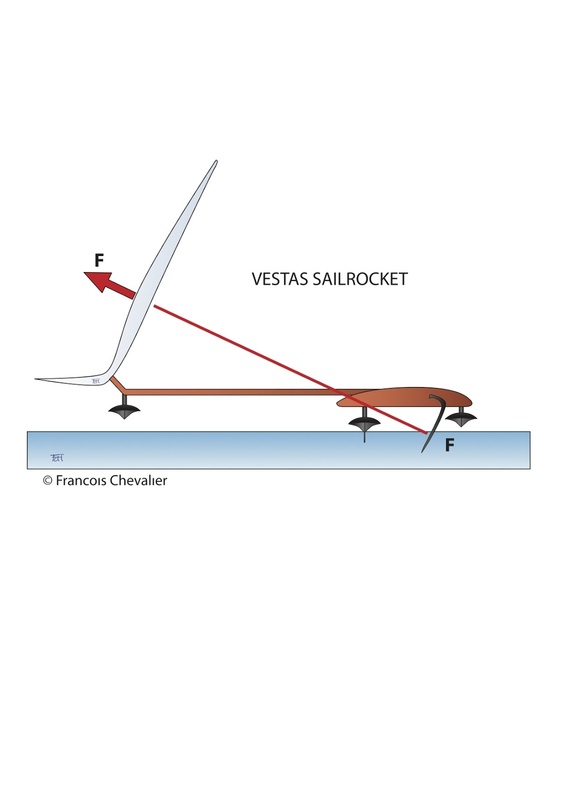 With the number 2 version (double parabolic cambered with air intake on the trailing edge), the vacuum created by cavitation – that prevented the device to achieve greater speeds – has released the power of Vestas Sailrocket allowing it to beat the record!